Ubuntu 10.10 Maverick Meerkat has just Released and after the completion of download and installation procedure of Ubuntu 10.10 you must install adobe flash player because most of the web pages on the World Wide Web(www) contains flash content.That’s why A flash player is required and adobe flash player is the ultimate choice.In Ubuntu 10.10 many things has changed as compare to it’s predecessor version Ubuntu 10.04 – Lucid Lynx,e.g you will notice some changes in ubuntu software center,in beginning itself the installation options and interface has changed. Go here and download Adobe Flash Player,then open the file with debian package installer.Then the installation will complete within few minutes.If you are still not sure then go here “Steps in Installing Adobe Flash player” for stepwise details. 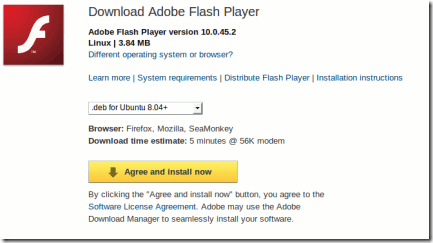 Open USC or SPM and search for ‘adobe flash player’; click on install(In case of USC) or mark the package and Apply(In case on SPM) to install the adobe flash player packages.You may have to authenticate before installing,if so then enter your ubuntu 10.10 login password to proceed.